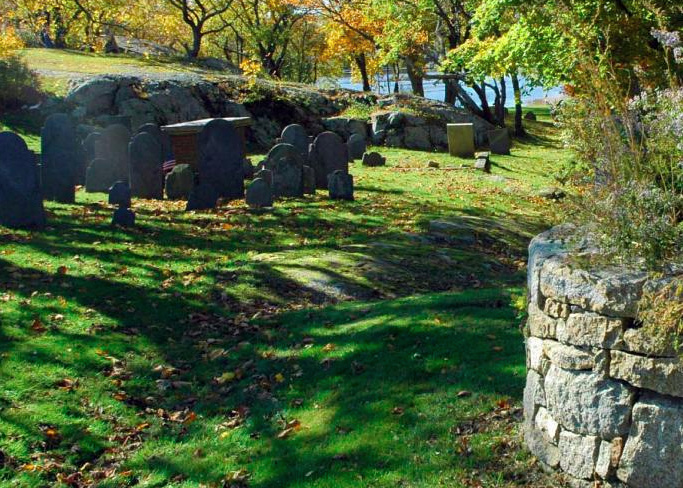 October 19, 2015 — If I ever put together a list of my favorite cemeteries in New England, I’m pretty sure Old Burial Hill in Marblehead, Massachusetts, will be inked on it. So I was jazzed when I realized I’d need to return to it this month for my Salem book project to visit the memorial of Wilmot Redd, one of the victims of the Salem Witch Trials. Besides that memorial, the uniquely craggy cemetery is known for its views of Marblehead Harbor, for being the site of the settlement’s first meeting house back in 1648, for the Susanna Jayne Tombstone with its bats and snake and skeleton, for being an H.P Lovecraft reference, and for being a movie filming location. Mostly that’s for Disney’s Hocus Pocus, but also for the 1993 thriller The Good Son, a Bad Seed-type movie starring a young Macaulay Culkin and a young Elijah Wood. And believe it or not, I want to talk to you about that. 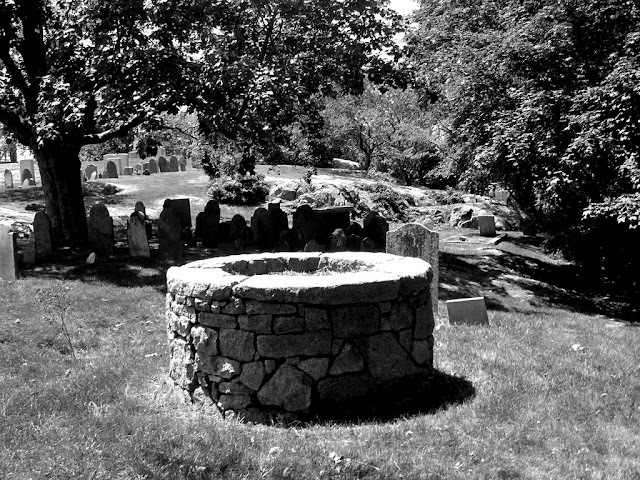 For that film, a pivotal scene takes place at the cemetery’s old well. The two kid stars walk atop it, smoking cigarettes and talking about death and mothers and deaths of mothers, as Culkin’s character gets more and more sinister until he threatens to throw the other down that well. I visited the cemetery yesterday and had a blast. At one point, I realized that I hadn’t stumbled across the well. 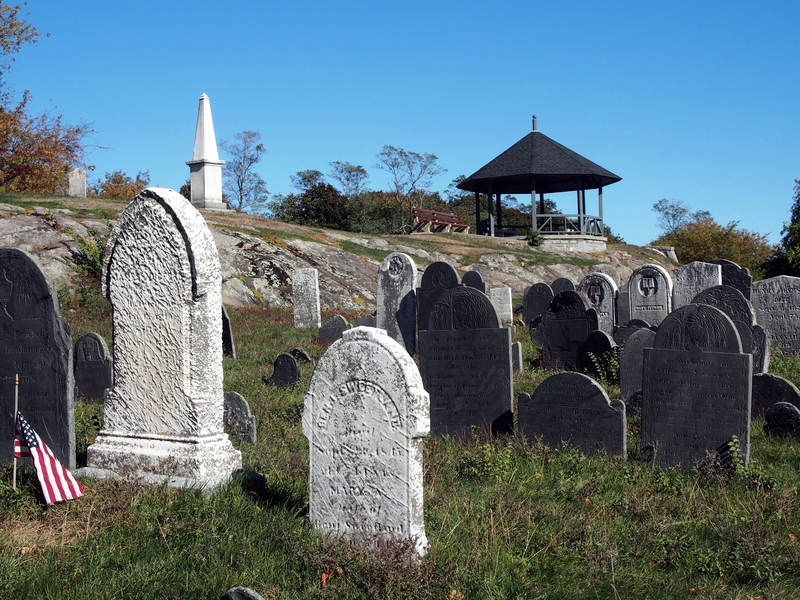 It’s not that big of a cemetery, but due to its rockiness, the cemetery has levels and a few relatively hidden sections. So I went looking for the three-foot-high circle of stone. But I couldn’t find it. And I got really confused. I mean, I knew it was there. I wrote about it in The New England Grimpendium. Even used a photo of it as the frontispiece to the book, although I don’t remember why. Heck, I brought the well up just a few days ago in my Horror Movie Graveyards I Have Known post. It was there. I was sure of it. I…just…couldn’t…find…it. So perplexed was I, that I broke my usual rules of avoiding social awkwardness and asked other wanderers in the cemetery. “Are you local?” I questioned a bespectacled man with a Nerf gun in his hands who was playing games with his son. When he answered yes, I asked him about the well. I asked her about the well, but got the same negative response. Finally, after more confused drifting across the hill’s crown, I braved the sun’s glare on the surface of my phone to call up that aforementioned image from the front of The New England Grimpendium, as well as the image I used in the Horror Movie Graveyards I Have Known post. Using those two images, I was finally able to figure out where it was. Gone. That’s where. Absolutely gone from the earth. In the spot where it used to be was a swath of cold grass. Upon my return, I searched online for some explanation. 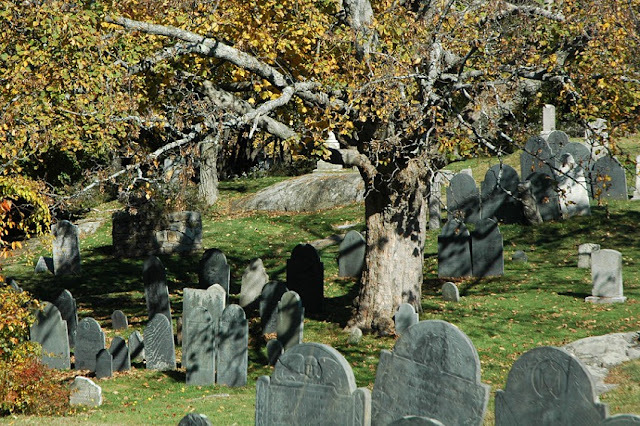 From the few images I had (unfortunately, since I’m in Salem all month, I’m separated from my photo archives), it looked like a tree was missing, as well. Maybe a storm took out both. Or age. Or zealous Macaulay Culkin fans. Now, I’m not saying we lost a treasured movie artifact when nobody was looking, although that’s probably how I’ll linkbait this post. After all, it was just The Good Son. And just one scene in it. So who cares? Well I care, but not for that reason. The loss of anything that I’ve specifically searched out in the past stings. It happened to all the relevant parts of the Dawn of the Dead mall. To the HMS Bounty. To the Higgins Armory Museum. Mars 2112. The Clearwater Madonna. Danvers Asylum. A lot more places, the losses of which range from the silly to the tragic. But every time it happens, it reminds me that it’s happening to sites I’ve not yet seen and to sites I don’t even know I want to see yet. Remember the demolition of the Ray Bradbury house? Still bugs me. 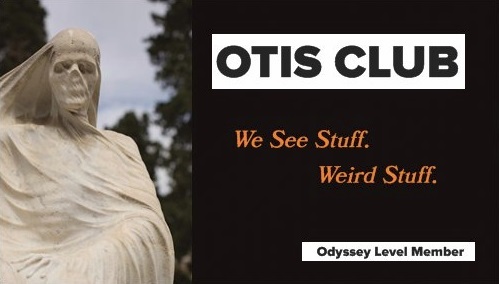 What motivates OTIS is my desire to see stuff. To put my actual eyeballs in the lightspace of physical objects that have some connection to history or culture. Experiencing those sites firsthand rounds out my reality. This exists, this is real, this happened. You should hear my psychiatry sessions. They’re surreal. I wonder if this feeling is exacerbated because I live in New Hampshire, where everywhere you look is a reminder of the Old Man of the Mountain, that pareidoliac face that adorned one of the states more prominent peaks since before the founding of the country. He’s on the highway signs, on the license plates, in the tourist shops. Everywhere but where he’s supposed to be. I moved to the state just five years after he tumbled into rubble. It’s moments like this one that I like to misquote Robert Frost and say, “Nothing ever stays.” So let The Good Soon well be a lesson to us all. Go see stuff before it disappears. Sure, it was just a silly circle of stones captured in a mediocre movie that was basically a vehicle for a child star riding high off a couple of Christmas movies. But next time, it could be something important…or at least personally important to you. Now I’ll sit back and await the email that tells me I was at the wrong cemetery. Photo credit: Matt, via Flickr. UPDATE: I sent an email to the Marblehead's cemetery commission and received a nice note from Margo Sullivan, the senior clerk there. Turns out the well was actually a prop specially made for The Good Son and that it was removed about three years ago. She had no record on the tree. But that's fascinating to me that a movie prop lasted for two decades in a historical cemetery, blending it like it belonged there. Makes me like the thing even better...and makes me even sadder that it's gone.